Film: I am a pretty big fan of the film Anthropophagus. It’s uneven and has an odd pace to it but for some reason I just love it. I didn’t see it until it was first released on DVD, but instantly fell in love with it. I was aware through various books and documentaries that there was a ‘sequel’ and in this world of previously never thought to be released movies appearing everywhere on DVD and bluray (Salo, in Australia?!? Who would have thought?!?) I had basically resigned myself to probably never seeing it. Thanks to Kickstarter though, this pseudo-sequel to Anthropophagus IS now available through U.K. (special mention should go to fellow To Watch Piler Explosive Action for his contribution) and here I sit, having just finally seeing it. 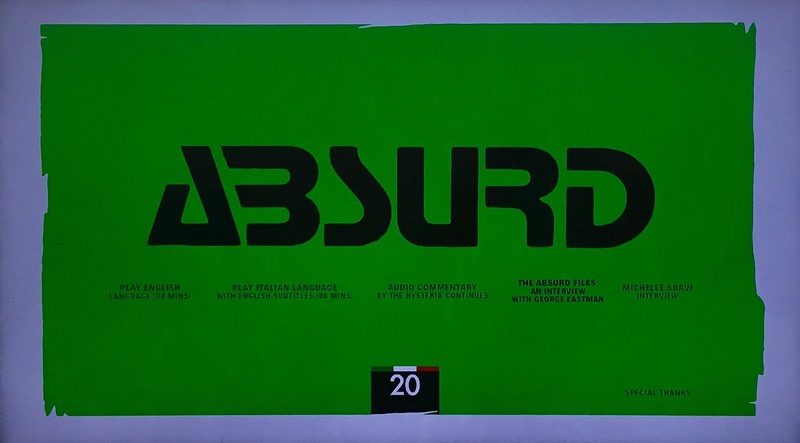 Absurd was directed by well-known Italian director Aristide Massaccesi, aka Joe D’Amato aka Peter Newton, who also directed the aforementioned Anthropophagus, as well as Buio Omega and was written by Luigi Montefiori, aka George Eastman aka John Cart, and whilst it does contain elements of the ‘first’ film, it is its own thing. … and by ‘own thing’ I mean it borrows heavily from John Carpenter’s Halloween!! 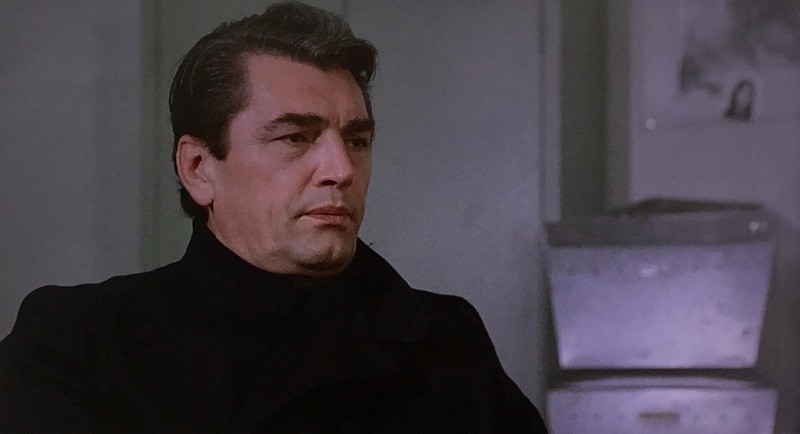 Absurd starts with a man, Mikos Stenopolis (George Eastman) being pursued by a another man, ‘Father’ (Edmund Purdom) and the chase ends abruptly when Mikos impales himself on a fence and is disembowelled! He somehow manages to get himself off the fence and goes to a local household who call for help, but what we discover is that Mikos is a psychopath who is able to heal from any wound at a rapid rate, and that ‘Father’ is a priest who is trying to destroy him! Of course there is a rapid succession of murders, and eventually Mikos starts to terrorise the family who assisted him after his disembowelment, including a young boy and an infirm teenage girl. The police are in a flap over the deaths but will the priest and his skills, whatever they are, subdue the felon, or will he be found to be impotent and another hero step up to the plate? Now it’s well documented that this riffs on Carpenter’s Halloween and that is evident from pretty much well the start, with Eastman playing an unmasked ‘Michael Myers’ and Purdom’s priest borrowing heavily from Donald Pleasance’s Dr Loomis. It occasionally seems to be touching on Halloween 2 as well, but with both films being released in the same year, I’m not so sure if that would be true, and if I’m honest, the similarity comes from the hospital environment so it’s probably just a co-incidence. The acting of the two leads is really what makes this film. Eastman with his grunts and insane stares are hilarious, and when paired with Purdom’s unfit (the running scene at the beginning is hilarious), and wrathful priest, it’s a B-grade nerd-gasm. The film is a fine watch, but I found Anthropophagus a far more entertaining, even through its failings. Format: This 88 Films region B bluray of Absurd runs for approximately 94 minutes and is presented in an really great 1.85:1 image with a clear LCPM 2.0 audio. First, there is actually two presentations of the film. The first is a longer dubbed English version, and the second is the 6 minute shorter Italian version with subtitles. There is an informative and quite funny commentary by the guys from the podcast The Hysteria Continues, which looks at… well, everything to so with the film and the history of various cast and crew involved. 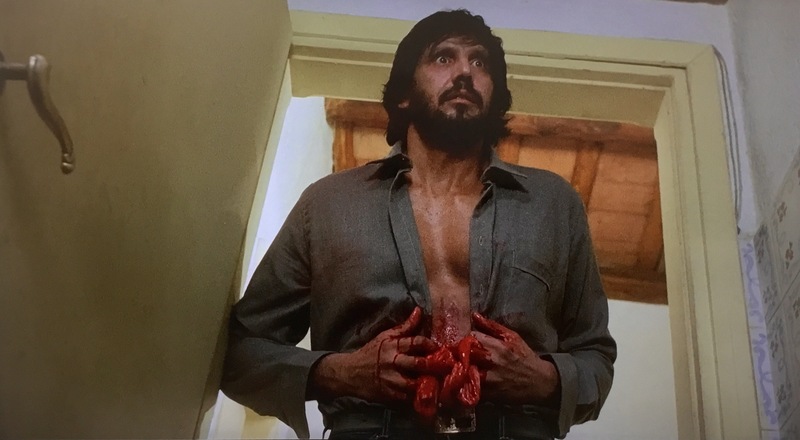 The Absurd Files: an Interview with George Eastman is an interesting interview with Eastman, aka Luigi Montefiori where he discusses his history in cinema, with a focus on this film. It is in Italian with subtitles. Michele Saovi Interview is a cleverly named Interview with Michele Saovi, again discussing his career and his relationship with Joe D’Amato. This is also in Italian with English subtitles. The menu screen also has a ‘special thanks’ section which lists the names of all the people and companies who donated to 88 Films’ Kickstarter. 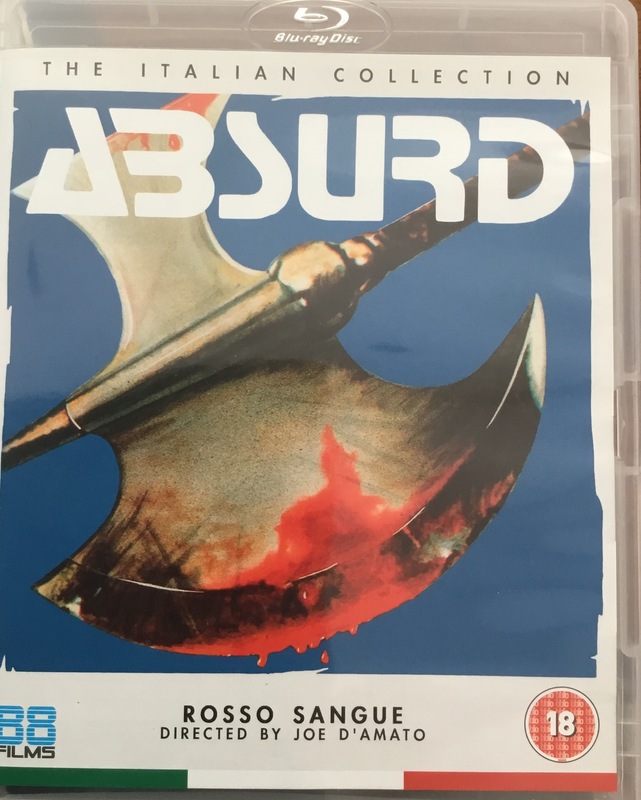 This edition of the film also offers a cool booklet from well know horror journalist and documentarian Calum Waddel called Video Nasties: Sleazy Does It which tells an abbreviated version of the ‘Video Nasties’ scare in the UK in the early 80s of which this film was a banned item. This disc, from 88 Films’ Italian Collection, also has a reversible cover. WISIA: Even though it’s a silly film, that emulates Halloween a fair bit, I’ll probably watch it again.